Viswanathan Anand missed out on an opportunity to press for serious advantage and settled for a draw with defending champion Magnus Carlsen in the fifth game of the World Chess Championship here today. Former BCCI president Shashank Manohar on Thursday questioned the BCCI's decision to postpone the Annual General Body Meeting, scheduled for November 20, saying it was against the constitution of the cricket body. Paceman Nathan Coulter-Nile took four wickets to fire Australia to a 32-run victory over South Africa in the first One-day International in Perth on Friday. Delhi medium-pacer Vikas Tokas picked up a four-wicket haul to help the Gautam Gambhir-led side edge past Services by three wickets in the Vijay Hazare Trophy (North Zone) One-day tournament. 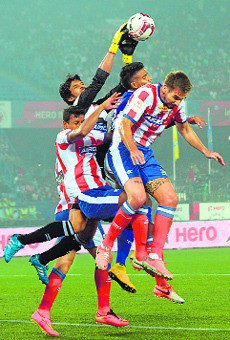 Table toppers Atletico de Kolkata (ATK) played out a breath taking, pacy goalless draw against Chennaiyin F.C in an Indian Super League encounter marred by a 12-minute power blackout at the Salt Lake Stadium here on Friday. As the Yo Yo Tigers players continued to boycott the league, the governing council of the Wave World Kabaddi League has suspended the franchise from further participation in the tournament. Novak Djokovic added another processional victory to the lengthening list at the ATP World Tour Finals with a 6-2 6-2 demolition of subdued Czech Tomas Berdych on Friday. The three-member panel formed to look into the demands of Terry Walsh to stay on as the chief coach of the national hockey team could not arrive at a decision on the issue today and fixed another meeting for Monday. The third draw in five games maintained parity and the scores now stand at 2.5-2.5 with seven games still remaining in the million Euros match. After a day's rest Anand yet again looked for an advantage with white pieces and Carlsen was pushed to the wall once more. However, just when the world thought it could be a dangerous advantage in Anand's favour, the Indian ace erred and took a safer path, allowing Carlsen to liquidate to a drawn rook and minor piece endgame. Opening with the Queen pawn, Anand faced a new opening for the third time in the match by Carlsen — a clear indication that the Norwegian has not been able to make up his mind and remains tentative with black pieces. For the record, in the first game of the match Carlsen had chosen the Grunfeld defence, in the third game he had gone for the Queen's Gambit declined, and today the world champion opted for the Queen's Indian defence. It was not a normal Queen's Indian as Carlsen went for some side line with early deviation giving Anand a small but lasting advantage. 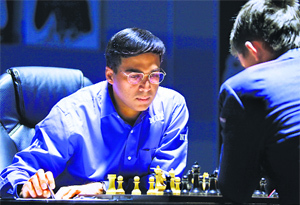 In the post-game conference Anand revealed that he had seen something like this before'. On his 16th move, Anand charged up things a little by going for a thematic central breakthrough and a handful of pieces changed hands in quick time thereafter. Carlsen took a practical decision on the 20th move by trading his bishop for a centralised white knight and thereafter white was either playing for a win or a draw. Carlsen definitely had seen deeper and believed in his position firmly as he went about collecting one of the white's pawn before exchanging the queens to reach a difficult endgame. Anand got his best chance on move 26 when a correct move would have prolonged the agony for Carlsen but did not feel it was worth the try. A pair of rooks flew off the board as a result and the players were soon staring at a deadlock with pawns on just one flank. After further trading of pieces the peace was formally signed after 29 moves. Earlier in the day, the BCCI counsel had told the Supreme Court that the AGM has been postponed soon after it was disclosed that N Srinivasan was one of the individuals probed by the Mudgal Committee in the spot-fixing scandal. Manohar said that the board has no authority to postpone the AGM after a decision was taken by the Working Committee. “During the hearing before the Supreme Court today, the names of N Srinivasan, Sundaraman, Meiyappan and Raj Kundra are disclosed. This means that the said persons are prima facie indicted in the report,” Manohar said in a press release. “It appears that during the hearing, as soon as the names of Srinivasan and Meiyappan were disclosed, the board's counsel made a request for the postponement of the AGM and elections scheduled to be held on November 20. Once the date of the AGM was fixed by the Working Committee, the same could not and cannot be altered by any office-bearer as they do not have authority to do so,” he said. Manohar said that under the BCCI constitution, the decisions taken by the Working Committee or the General Body are final. “It is thus evident that the instructions given to the board counsel are only with an intent to suit Srinivasan as that would ensure that he still remains a back seat driver. The moot question that needs to be answered is, who gave the board counsel instructions to plead for postponement of the AGM?” he asked. Manohar wondered what will happen to the affairs of the board if the investigation/hearing goes on for some time. “The second question that comes to mind is, if the investigation/hearing pulls on for several years, then will the Board keep functioning under the same set up?” he asked. He charged Srinivasan of running the board affairs from the backdoor and made an appeal to “all members of the board to rise to the occasion and prevent the board and the game from being further destroyed”. The moot question that needs to be answered is, who gave the board counsel instructions to plead for postponement of the AGM? The second question that comes to mind is, if the investigation/hearing pulls on for several years, then will the Board keep functioning under the same set up. Srinivasan continues to run the board which is amply evident from its functioning. Australia captain Michael Clarke was ruled out midway through the match after re-aggravating his hamstring injury but stand-in skipper George Bailey scored a telling 70 to help drive the hosts to 300 for eight wickets after a mid-innings collapse. Newly crowned ICC cricketer of the year Mitchell Johnson gave Australia the perfect start in defending the total, the fast bowler removing openers Hashim Amla and Quinton de Kock with just 18 runs on the board. 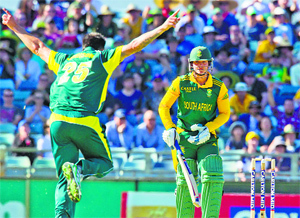 South Africa captain AB de Villiers and middle-order batsman David Miller (65) combined for 126 runs to drive the tourists past 200, but Coulter-Nile broke the partnership when Miller miscued to Mitchell Marsh at mid-on with 14 overs left. De Villiers smashed 80 off 76 balls but was run out by some sharp fielding by Steven Smith, who came in for Clarke and threw down the stumps at the non-striker's end. With South Africa reeling at 202 for 6, Coulter-Nile struck again to remove Ryan McLaren for a duck and Dale Steyn for six, both caught behind by wicketkeeper Matthew Wade, included in the team for the injured Brad Haddin. In between, paceman Josh Hazlewood dismissed Vernon Philander for one run, and though the tail wagged for another 46 runs, part-time spinner Glenn Maxwell had Imran Tahir caught at long-off for 22 to seal the result. David Warner (46) and Aaron Finch (35) earlier saw off a fiery early spell from Steyn to compile 94 for the first wicket before seamer Philander removed them both in the same over. Clarke gloved a catch for 11 and Watson, recalled for his first one-day match after a long lay-off with injury, managed only 13 before sweeping Tahir to Morne Morkel at fine leg. All-rounder Marsh also went cheaply to leave Australia reeling at 144-5 but Bailey, Wade (35) and Glenn Maxwell (29) defied the South Africans to drive Australia to a competitive score. Needing 147 for victory, Delhi made heavy weather of their chase by failing to get partnerships going but finally got their target in 34.4 overs. Juggling with their opening combination in the tournament so far, Gambhir (4), who struck a fluent 93 in the last match, came in with Unmukt Chand (2) but soon the score read 6 for 2. Virender Sehwag, who also looked to be back in form after his smashing 80 in the previous game, threw away his wicket after a quick 20.The middle-order followed the same template, with batsmen throwing away good starts to give Services a ray of hope. At Nadaun, Jammu and Kashmir scripted a fine eight-run win over Haryana in an inconsequential match. J&K posted a challenging 284/8 after being put in to bat, and then restricted Haryana to 276 all out in 49.4 overs. Ian Chauhan (64), Shubham Khajuria (45) and Samiullah Beigh (47) made vital contributions for Jammu and Kashmir. The blank scoreline came as a surprise to football followers following a lively start to the game, with both sides creating opportunities to crack open each other's defences. Chennaiyin had more possession, but Atletico also had their moments and retained their pole position with 13 points from eight exchanges. According to a statement issued by the organisers, the non-payment of players' salaries has a material adverse effect upon the reputation or standing of the league. On Wednesday night, Yo Yo Tigers players had officially lodged a formal complaint to the League regarding the pending payments. Meanwhile, United Singhs scored a massive 77-42 win over Lahore Lions to become the second team to secure their berth in the semifinals. Skipper Sandeep Singh Sandhu of United scored 14 stops. The world No.1 was virtually guaranteed a semifinal berth before walking on court at the O2 Arena, but made doubly sure by cruising past Berdych in little more than an hour. A day after Roger Federer dropped only one game beating home favourite Andy Murray to win Group B, Djokovic was also in ruthless mood to top Group A and guarantee ending the year ranked as world No. 1 for the third time. The Serb has now won 30 indoor matches in succession since the ATP World Tour Finals in 2012. Of the 11 round-robin matches played at the tournament this year only one has gone to a deciding set. Djokovic, looking for a third consecutive title at the London year-ender, will face Japan's Kei Nishikori in the semifinals on Saturday when Roger Federer will be up against fellow Swiss Stanislas Wawrinka unless he loses heavily to Croatia's Marin Cilic. Roger Federer beat Andy Murray 6-0 6-1. He managed that objective in 24 spellbinding minutes, allowing former Wimbledon champion Murray only eight points in the opening set, then went in pursuit of a rare ‘double bagel’ — the nickname for a tennis whitewash. The panel comprising former hockey captains Ajit Pal Singh, Ashok Kumar and Zafar Iqbal met Walsh, Hockey India Performance Director Roelant Oltmans and Sports Authority of India officials for over three hours but could not take a final decision. HI officials were not present at the meeting. Panel chairman Ajit Pal said that there was a discussion on the demands raised by Walsh but decided to meet again. “We had a positive discussion on every issue. We told Terry our point of view and heard his point of view. We told him our problems and heard his. Since we met for the first time today to discuss the issue, we decided to meet again on November 17 where Hockey India and the Sports Ministry officials will be present and I expect a decision on that day,” said Ajit Pal. Ashok Kumar said Walsh was adamant on some issues, including 120-day paid leave. “We have told him that this is not in our system. He also has time to think about this before a final decision is taken. The discussion was positive,” Ashok said. SAI Director (Teams) Sudhir Setia said since the main party Hockey India was absent, no decision could be taken. “They (HI) were pre-occupied with their programme, so we have fixed the next meeting on November 17,” Setia said. Mitch Johnson named cricketer of the year: Australia fast bowler Mitchell Johnson has matched compatriot Ricky Ponting's feat of winning the International Cricket Council's (ICC) Cricketer of the Year award twice, the governing body said on Friday. The 33-year-old Johnson won the Sir Garfield Sobers trophy for the second time after winning the award in 2009 and was also named the ICC Test cricketer of the year. Former Australia captain Ponting won the title in 2006 and 2007. Left-arm paceman Johnson fired Australia to a 5-0 Ashes sweep of England and a 2-1 series win in South Africa between August 2013 and September 2014, taking 59 test wickets at an average of 15.23. South Africa’s AB de Villiers was voted the ODI player of 2014. England wicketkeeper Sarah Taylor was named women’s player of the year. Indian tour has hurt Lanka's WC preparation: Ranatunga: Refusing to blame the players for the ODI debacle in India, World Cup winning former Sri Lanka captain Arjuna Ranatunga said the country's administrators are responsible for the fiasco which has disturbed the team's World Cup preparations as well. Ranatunga said he holds Sri Lanka Cricket, the Ministry of Sports, his former teammates Sanath Jayasuriya, Marvan Atapattu and skipper Angelo Mathews responsible for the side's poor show so far. 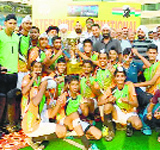 Jalandhar boys clinch under-17 Nehru hockey: Government Senior Secondary School, Lodawali Road, Jalandhar, beat Birsa Munda Vidyapitha, Rourkela, 5-1 at the Shivaji Stadium, New Delhi, to clinch the 43rd Nehru Junior Hockey Tournament on Friday. For the Jalandhar team, Kawaljit Singh (25min), Dilpreet Singh (38min, 44min), Harmeet Singh (64min, 69 min) scored. For the losing team, Amit Chirmano scored the lone goal (36th min). In the semifinals, Jalandhar boys beat CRZ Senior Secondary School, Sonepat 6-5. AIBA grants Boxing India permanent membership: Completing India's rehabilitation into the international boxing fold, AIBA on Friday unanimously gave permanent membership to the recently-elected Boxing India during its quadrennial congress in Jeju Islands, Korea. “We are extremely delighted to be unanimously accepted as the permanent Member of AIBA, at the ongoing AIBA quadrennial Congress at Jeju Island, South Korea,” Boxing India President Sandeep Jajodia said in a statement. India was provisionally suspended in December 2012 for “possible manipulation” in the erstwhile Indian Amateur Boxing Federation's elections. Indian handball teams to play in Pakistan: Indian handball teams (under-21 men and under-20 women) will be participating in the IHF Challenge Trophy South and Central Asia Zone-II at Faisalabad from December 3 to 7. Juguminder Singh will be the coach of the women’s team. The coaching camp will be held at SAI Centre, Lucknow from November 11 to December 1. The contingent will leave Delhi on December 2 and return on December 8.